With CERN‘s new machine, the Large Hadron Collider, very much in the news at the moment, it made me think back to the television series, Channel Four’s Reality on the Rocks , broadcast in 1995, which first made me interested in visiting CERN, and no doubt played a part in me eventually working with large scientific facilities. I only have vague recollections of the series, but the one part that had stuck in my mind was where the presenter, Ken Campbell, visited the CERN tunnel, then home to the LHC’s predecessor, the Large Electron-Positron Collider. I can remember that the fire alarm sounded while he was there, and along with everyone else, Ken had to climb the stairs to return to the surface – all off which was shown in the programme. While I could remember the name of the programme, I couldn’t recall the presenter’s name, and just remembered him being quite an eccentric character. I looked the series up about two weeks ago, and subsequently looked up Ken Campbell, and discovered he had a distinguished career in the theatre, both as an actor and writer, with some of his productions seemingly rather avant garde. He even appeared in an episode of Fawlty Towers , and was also interested in science fiction, the paranormal and popular science, hence his presenting several TV series. As an occasional Wikipedia editor, I decided Ken Campbell’s article should be located directly at Ken Campbell rather than Ken Campbell (actor), his namesakes being rather more obscure. The article was moved last Wednesday night. 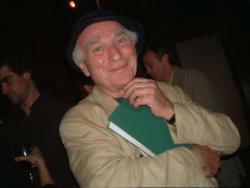 On Sunday night, Ken Campbell died suddenly at the age of 66. Of course, my thoughts are with his family and the colleagues who worked with him on his many varied projects. I doubt that reading up on a TV presenter after 13 years only for him to die less than two weeks later would be paranormal enough for Ken himself to investigate. Rather, I think it’s just an unfortunate coincidence. At least everyone now looking for information on him won’t have to read about a Canadian evangelist or Scottish goalkeeper. By the time I finally visited CERN, I wasn’t able to go down into the famous tunnel as the LHC was already under construction, so the closest I could get was the top of the shaft into which one of the huge, new detectors would later be lowered. It’s sad that Ken Campbell didn’t live to see the switching on of CERN’s new machine. As a rare example of someone who at least made an attempt to cross the divide of C. P. Snow‘s Two Cultures , he made many people happy, and, quite possibly, as an actor inspired more young physicists than most physicists will do in their lifetimes. I was copying my old videos onto Harddisk and Reality on the Rocks happens to be one of them! I idly looked up Reality on the rocks and found this Blog. I had no idea Ken had died- Sad thing to Learn. I would recomend reality on the Rocks to anyone – teaches a good grounding in cosmology for the layman! He also did a program about the Brain – though the name escapes me. CERN itself features in the second programme. Thank you very much for the information of where to access Reality on the Rocks – very helpful! Ken was a hugely engaging, gifted and funny man with an endlessly enquiringly mind and a enormous collection of books. Many hundreds of people were at his woodland funeral in Epping Forest near London in August 2008, while even more attended a celebration of his life – including his major work in theatre, his acting and his award-winning one-man shows – the other night at the British Library. Two BBC radio documentaries about Kennand his legacy have also been broadcast within the past few weeks. He is still much misssd by family, friends, fans and his parrot Doris who now lives with me. Some episodes of Reality on the Rocks are now available on YouTube, while the other science series Ken presented in the 1990s were Brainspotting and Six Experiments That Changed the World. RIP, Ken.